We started with the same values that matter to us now: 1) be globally responsive 2) partner with local organizations and 3) co-create change - while respecting what does not need to change. HELP was formed in 1999 as a collective effort to respond to what was, at the time, the worst natural disaster in decades. 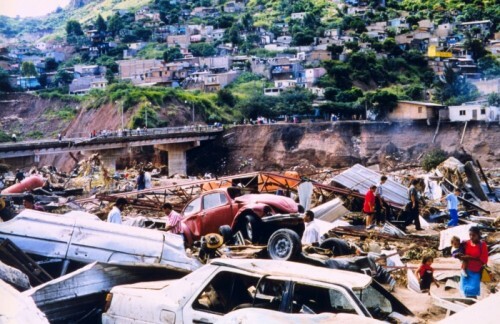 Hurricane Mitch devastated most of Central America but Honduras was hardest hit. HELP's initial team (based in a University at that time) founded HELP International in 1999, as H.E.L.P. Honduras. The initial 46 volunteers raised funds and spent four months conducting humanitarian aid projects and working with FINCA Honduras (a recognized leader in microfinance) to recapitalize and expand local microcredit programs. These initial projects affected the lives of an estimated 4,000 people, providing relief and longer-term support to many who were left homeless and jobless by Hurricane Mitch. From this one team in Honduras, HELP International has grown to work around the world. Thousands have signed up to make a difference in the world, putting their personal lives on hold for months at a time. Our goal when we started was to respond to the disparities around us, to select partners with quality programs who will remain in place after we leave, and to respect the local ecosystem while helping co-create local change. While we have branched out from our roots in microfinance, we maintain a commitment to achieving our goals using a variety of development tools. HELP has grown into a registered 501(c)3 nonprofit organization specializing in four core competencies: (1) public health, (2) education, (3)entrepreneurship/business, and (4) infrastructure development projects. Though in our beginnings HELP has engaged in primary aid relief in the form of earthquake and tsunami aftermath relief efforts, our drive is to work in the context of ‘secondary development’ with training initiatives and program partnering. Given our diverse teams comprised of students and young professionals hailing from a variety of career and academic tracks, our multi-faceted approach to development allows us to facilitate projects catering to a wider range of fields and disciplines. HELP International develops, executes, and monitors grass-root projects in areas related to public health, health campaigns and outreaches, medical camps, teacher training, literacy, after-school tutoring, orphanage support, at-risk youth programs, gender empowerment, agriculture, business education, income-generating activities, elementary education, and more. We pride ourselves on being able to develop a customized experience in the developing world based on our individual teams' skills, backgrounds, and paired with evaluated community need. HELP currently runs programs in India, Uganda, Peru, Greece, Thailand, Fiji, the Philippines, and Nepal. HELP continues to focus on facilitating poverty alleviation worldwide by selecting and mentoring motivated and like-minded interns and volunteers to fight poverty and empower people to create socially responsible and sustainable change. We would love for you to join our team.